OBIEE up to 10g had a limitation around session variables which are row wise initialized ,in that you cannot use that variable to initialize another subsequent session variable. Good news!! 11g seems to have a fix for this. select ‘REGION_LIST’ ,region_id from region_table. Now lets say you want to initialize another row wise initialized variable based on the ‘REGION_LIST’ variable you had initialized earlier. For e.g. all the accounts belonging to the ‘REGION_LIST’ variable. 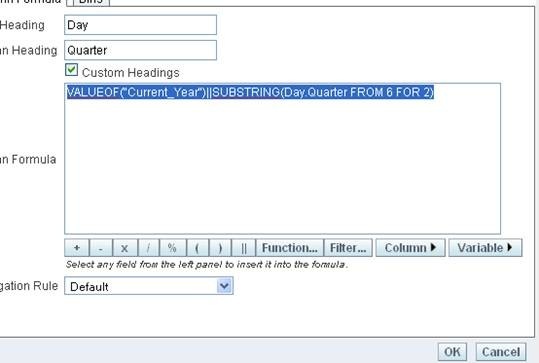 Keep in mind this will go back to the database as an in list, coma separated and the values would be in single quotes. There was a question asked on this post here and I thought of having another post to answers Vik’s question. We have a Similar req at my client, but little bit different. As you can see from the properties of a presentation column you could see that there is a provision to specify a custom display name. I have two users created in the RPD. USER1 and USER2. 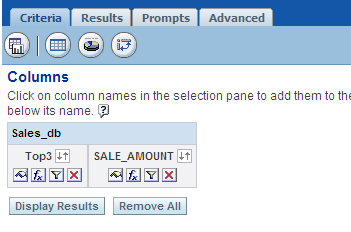 My objective is to give a custom display name for a Column (Brand column in the Product Table). 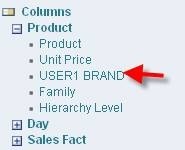 User1 would like the display to be USER1 BRAND and user2 USER2 BRAND. I have created a session variable (BRAND_DISP_NAME) which would be initialized to USER1 BRAND for user1 and USER2 BRAND. In the properties window for the presentation column brand do the following. Now lets see how the column shows up for these 2 users in Answers. As shown in the screenshots above the display name for the column “brand” is different for these two users. Hope this answers Vik’s question. Here is an interesting scenario that I came across recently. The client has 2 hierarchies based on cost centers, Management and P&L. The business push behind this was that lot of users had dual roles in terms of how they look at expenses. 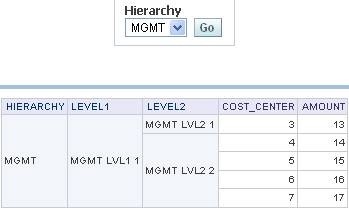 Both the hierarchies had cost center at the lowest level and the same number of levels in the hierarchy. The differences were 1) users would have access different set of cost centers in both hierarchies (not necessarily mutually exclusive) 2) roll ups for the cost centers would be different in both hierarchies. The business had a couple of requirements around this. 1) The users should be able to pick the hierarchy that they would like to view the report by. 2) When the user flips between the hierarchies the security applied should change accordingly, ie if they are viewing the report by the P&L hierarchy then the P&L security should be applied and if they pick management then Management hierarchy security should be applied. Here is a very simplified version of how we implemented the solution. 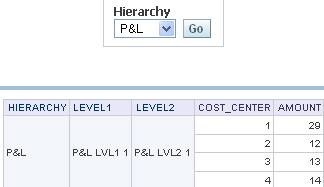 User1 has access to cost centers 1-4 in the P&L hierarchy and 3-7 in the Management Hierarchy. Here are the 2 hierarchy tables for this example. I have an expenses fact table where the cost center is a key. Now lets see how this is modeled in the RPD. There is a similar join between the Sec Profile Mgmt table with the Management Hierarchy table. Here is how the BMM layer is done. 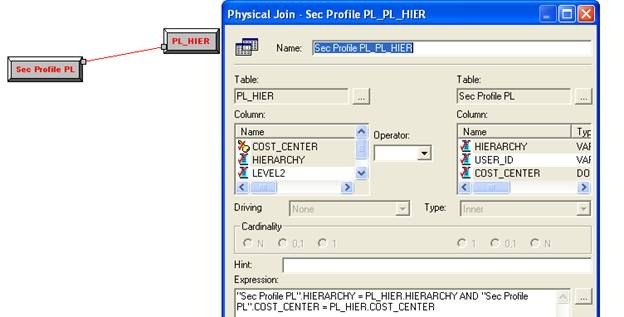 The cost center table will have 2 logical sources and each of these logical sources would have an inner join to the appropriate sec profile alias table. All the columns are mapped to both the logical sources. 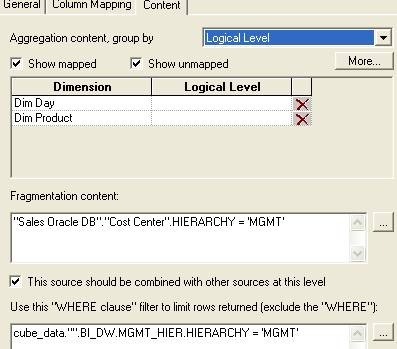 Add the user_id column to the logical table and map it to the appropriate logical sources. Now all that’s left is to go to the relevant group in the RPD and add the security filter. Also create a prompt and set a presentation variable in the prompt. 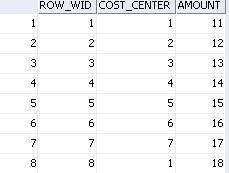 Its very important to have the filter on the hierarchy column in every query otherwise you would end up overstating the numbers. The users want to define the joins between tables in answers, when doing adhoc queries. These views are used for real-time reporting and were sitting on top of EBS tables. This requirement was driven by the fact that most of these views could be joined in more than 2 ways depending of the business scenario. In a typical design we would create alias tables to correspond to each of the joins. But in our case the users were not able to define the joins in advance and there is a possibility of the view definitions changing over a period of time. To sum it up the users wanted to simulate a SQL tool with answers, sort of. In our case View 1 and View 2 could be joined up to 4 different ways and there were quite a few views like that, making the whole aliasing approach cumbersome. One of the developers in the team came up with an idea, though it’s not the perfect solution, but definitely simple and worth mentioning. First up we extended all the views in the database by adding a dummy column and the values were always 1. The physical layer in the RPD would have the join between the views as View1.dummy = View2.Dummy. There is nothing special about the BMM layer, the usual and the same with the presentations layer. Now comes the answers part. 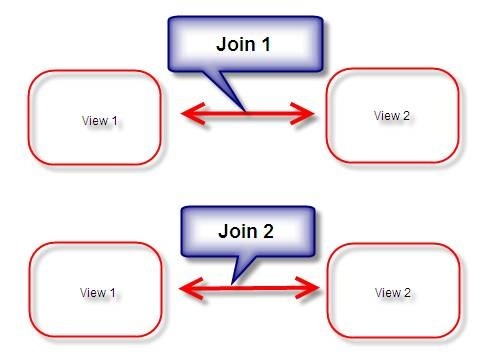 If I were to run a query between the 2 views without any filters in the query the results would not make any since the join is View1.dummy = View2.Dummy. Let’s say for query 1 I want to join on View1.col1 = View2.col1. Here are the steps. Equate View1.Col1 to View2.Col2 in the filter SQL. This will have your physical queries appended by 2 join conditions 1) which is defined in the RPD(View1.dummy = View2.Dummy) and 2) View1.col1 = View2.col1 . You could define any joins in a similar fashion. One serious limitation is that the joins are always inner joins. Period Comparison without time series or ago functions. 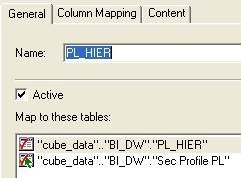 Recently at a client site we had to connect to some tables in owned by another application and generate some reports for our OBIEE user base. We had no control over the table structures in the external application and we had to generate some time series measures. 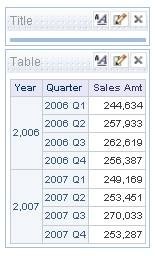 We couldn’t use the time series wizard or the ago functions provided by OBIEE. The report had to display all the quarters of the current year and the growth for the same period for each of the quarters. This is how the repots looks like in a regular table view in answers. And the picture below shows what the client wanted. We could have done the same with a complex case expression but we found an alternative which is more elegant and better performing, using pivot table calculations. 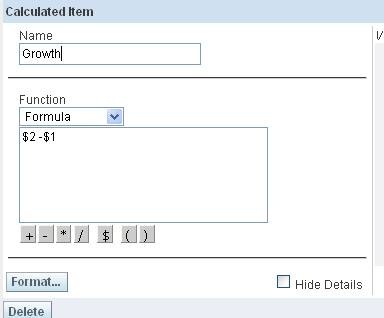 First up we need to change the formula for the quarter to the one shown below. Current year is a repository variable, this could also have been a presentation variable. Now create a pivot table for this with the year on the left and the quarter on the top. The first one (Actuals) as $2 and the second one as $2-$1 (growth) and then hide the details and this would give the sales amt for all the quarters for the current year and the growth. 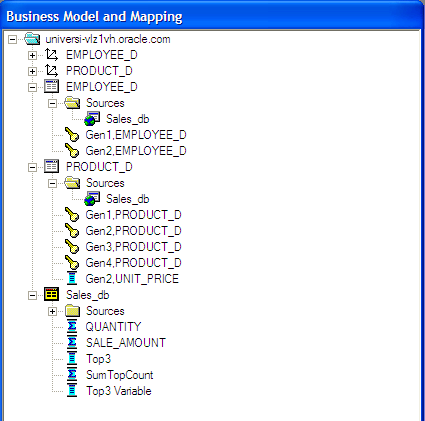 We can make use of native Essbase Functions using the Evaluate and Evaluate_Aggr Expressions in OBIEE. 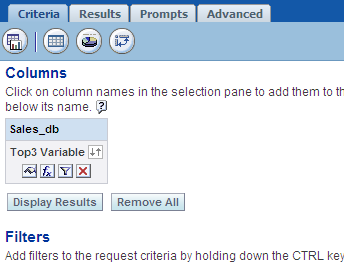 Let’s first see how we can call an Essbase Function TOPCOUNT from within OBIEE. Where 3 is the INDEX of the Topcount function. In the above statement the index n which is equal to 3 is passed to the Essbase Cube in order to retrieve the TOP 3 products ranked by sales. 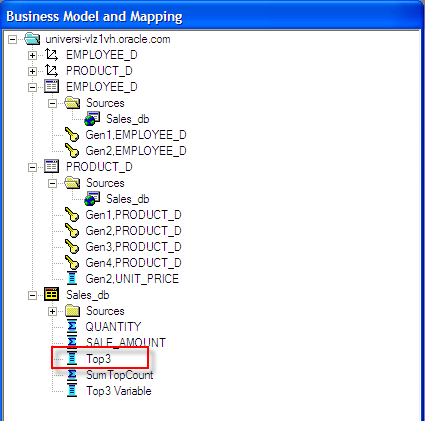 In order to Call this function from within the OBIEE RPD, I have created a new logical column in the BMM layer called Top3 and in the Expression Builder I use the following statement. When entering the expression I would recommend inserting the required columns from the Expression Builder window rather than typing it. You will be less prone to make syntax errors this way. Now when you drag this new column into the Presentation Layer and run a report in Answers you will see that the Top3 column does in fact give you the Top3 products ranked by Sales. Now let us see if we can make the index in the topcount (3 in the above case) function dynamic. Basically what I would like to do is to populate the index using a variable instead of hard-coding it in the Expression like we did earlier. Let us see if the Evaluate Expression will work if we use a sessionVariable as the index. You can see that I have replaced the index with the session Variable Value. Now let us run the report and see what we get. You can see that an error is generated. 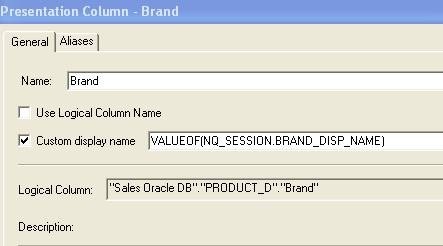 If you look at the MDX being generated by OBIEE then you find that the the session Variable value is not being passed into Essbase and so we get the Unknown Member used in Query Error. So to my knowledge it is not possible to dynamically pass the value of a OBIEE session variable to Essbase as an index value. This is a significant handicap that puts limitations on the use of Evaluate Expressions to leverage the native Essbase Functions.